New Director Christine Hooper discusses insomnia and her RCA graduation film; On Loop. Taken from shots 153. For Christine Hooper, studying animation at the Royal College of Art (RCA) will be remembered for lying awake in the early hours with anxious thoughts. But that’s not necessarily a bad thing. Suffering from a bad case of insomnia throughout her first year on the course, when it came to the subject matter for her graduation film, there was only ever going to be one theme. She decided to draw on her own sleepless nights for the project designed to be ‘seen’ through the eyes of an insomniac. Hooper built the bedroom set for her stop-motion film in a dank basement at the RCA and spent the majority of her grad year there, where it was constantly lit to feel like 4am. 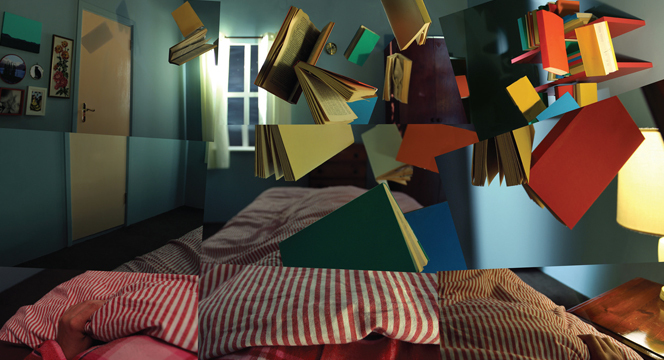 The film’s aesthetic was inspired by David Hockney’s photomontages and Hooper explains that she wanted to achieve a cubist feel, with time layers to represent the idea of fractured thoughts. Sound and script were just as important, and after attending live spoken-word poetry sessions as part of her research, she became inspired by the medium and adopted the style. When it came to finding a voice artist to speak the erratic thoughts, Hooper approached fellow insomniac and actor/comedian Susan Calman.